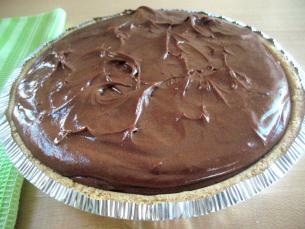 This easy no-bake Chocolate Cheese Cake Pie is a perfect recipe for the beginner cook! The hardest part is that before you get to dig in, the pie has to set (get firm) in the refrigerator for at least 4 hours before serving it! 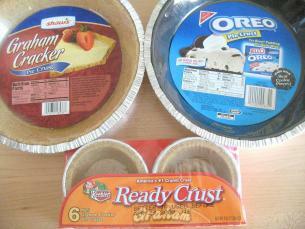 There are many pre-made crumb pie crusts available at the grocery store, including ones made from graham crackers or from chocolate wafers. If you are up to making your own crumb pie crust, all the better! 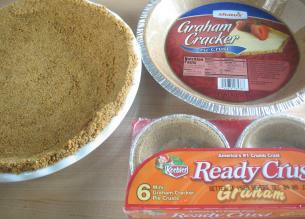 I have done a photo-tutorial on How to Make a Graham Cracker Pie Crust. You can choose which crumb crust you would prefer, depending on your cooking skill level. 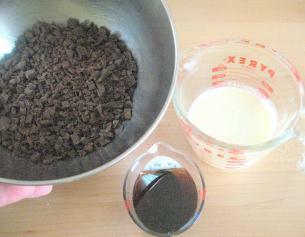 Start by finely chopping 12 ounces of bittersweet chocolate. 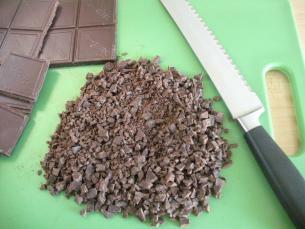 (A serrated edge knife actually works the best for chopping both chocolate and nuts.) 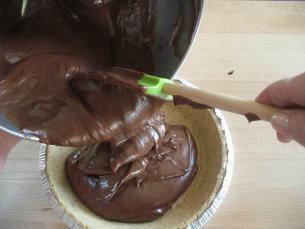 Put the chocolate into a heat-proof glass bowl or a metal bowl. Now measure out 1/2 cup of the heavy cream (the remaining cup is going to get whipped!) and 1/4 cup (which is 4 tablespoons) of corn syrup. 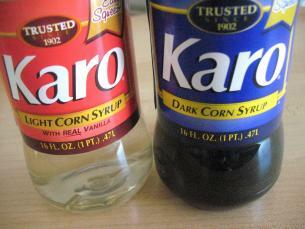 You can buy either light or dark corn syrup. In this recipe I am using the dark (which has a more robust flavor), but you can use the light if that’s what you have on hand. For those of you who live in parts of the world where corn syrup is not readily available, there is a fabulous description of liquid sweeteners and the appropriate substitutions at Cooks’ Thesaurus. These three ingredients need to get melted together on top of simmering water. 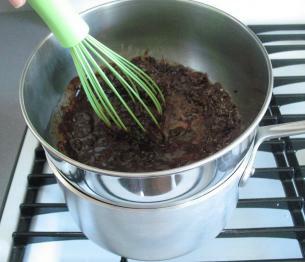 Set the chocolate mixture on top of the simmering water. The water itself should not be touching the bottom of the bowl that the chocolate mixture is in. Give the chocolate an occasional stir. Do not remove it from the stove until the chocolate is totally melted. This will take only a few minutes at most. 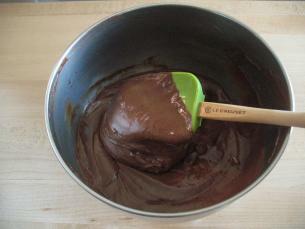 Remove the chocolate from the stove and let it cool for about 5-10 minutes. Set the bowl of whipped cream aside for just a moment. 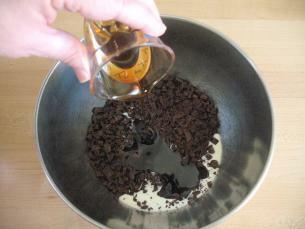 With your electric hand mixer, beat in the softened cream cheese to the cooled melted chocolate mixture. 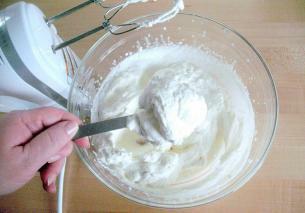 Using a rubber spatula (not the electric hand mixer! 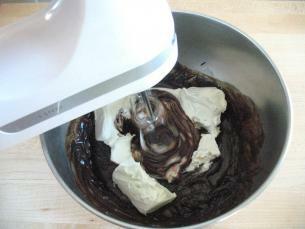 ), the whipped cream needs to get folded into the chocolate mixture. 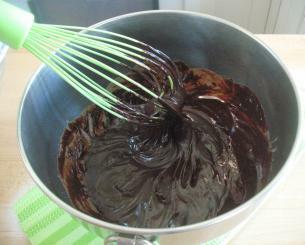 This lightens the chocolate mixture resulting in the perfect taste and texture for the final pie. Folding is a technical cooking term that means to combine generally a lighter ingredient (the whipped cream) into a heavier ingredient (the chocolate mixture) by first placing the lighter mixture on top of the heavier mixture. Then vertically cutting through both ingredients in the center of the bowl, across the bottom and back up the side, across the top and …well that just sounds way more complicated than it is! Check out this video at Expert Village on How to Fold! By the time you have finished folding all the ingredients will have a uniform look. The filling is now ready to pour into the prepared pie shell. This pie will take a good 3-4 hours minimum to set in the refrigerator. Once it does, it will develop a perfect “Cheese Cake” consistency, which no one can resist! WOW, Kathy. I wouldn’t serve that lightly: it looks like the kind of pie that’s liable to get you married! That is one serious-business looking recipe. And it also looks much easier than a standard no-bake cheese cake! A lot of “no bake” pies call for Cool Whip which has a very distinct flavor. Some people love it and some people hate it. I try very hard to avoid using too many processed foods in my recipes here at startcooking.com. 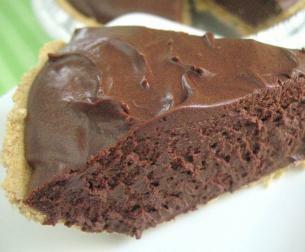 I have also done a no bake Chocolate Fudge Pie using silken tofu, which is a whole lot healthier than using heavy cream! This looks like a great summer party recipe! I definitely need to make this when there are a lot of people around so I don’t eat it all!! :) Thanks. I have been watching/reading your blog and have enjoyed the “back to basics” you give. I have been cooking (although not very good) for over 20 years. I have had to learn by trial and error, but have surrvied until now! 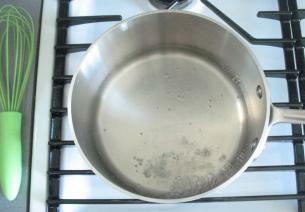 I love your posts on easy to make recipes as I am teaching my children the basics of cooking early! My husband is a diabetic and we have tried substituting Splenda for many of the recipes – some with success and some without. Could you do a review of artificial sweeteners and how/when to substitute in baking/cooking and non- heat related mixing? Thanks for the time you spend on this blog! Hehe, that sure looks delicious :D!!! A bit too delicious for me :). 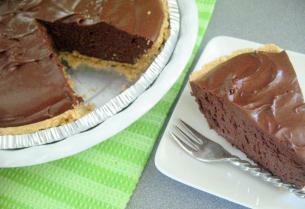 This Chocolate Cheese Cake Pie is truly decadent! Sherri here is a link for sugar substitutions. I have never used this source before so you will have to let us know how it works! The trick to this pie is to be sure to let it chill completely before serving it. Then you’ll have a great tasting pie with the perfect texture! I love chocolate, gonna try this today only, it looks delicious:) Thanks Kathy! The Splenda site has a lot of useful information on Splenda’s qualities in cooking and baking as well as recipes. This recipe would not work using splenda. The Karo syrup is not there just to add sweetness. It effects the consistency as well. First of all take relax and nice deep breath! In bowl number ONE, put the chopped chocolate, just 1/2 cup of the heavy cream and the corn syrup over simmering water to melt the chocolate.Melt the chocolate, stirring occasionally. Remove the bowl from the heat and let it cool for 5-10 minutes. 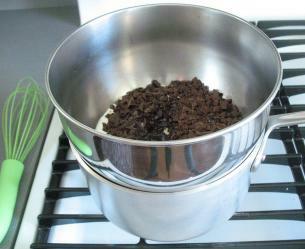 Then, using an electric mixer beat in the softened cream cheese to the chocolate mixture. 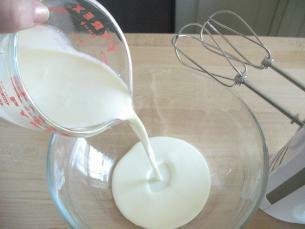 In bowl number TWO, beat with an electric mixer, the remaining 1 cup of heavy cream until it holds stiff peaks. 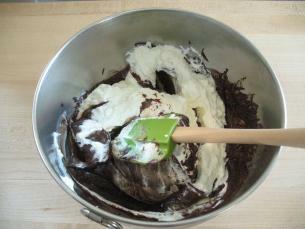 Then fold the whipped cream into the chocolate mixture and that’s it! 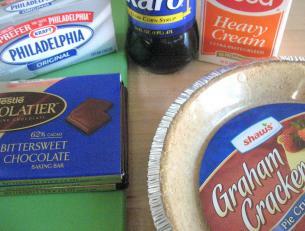 Scrape the filling into a prepared crumb crust pie shell and refrigerate for at least 4 hours. Congratulations! I hope it turns out well! Great recipe! But we dont have corn syrup here in South Africa What can I use as a replacement, if anything? For you, and many others, who live in parts of the world where corn syrup is not readily available, there is a fabulous description of liquid sweeteners and the appropriate substitutions at Cooks’ Thesaurus. Your Brownies look really delicious! Let us know when you have perfected your recipe! What a yummy chocolate cheese cake. I’m very thankful for this website. First, my English is not very good. And I never cooked before. But lucky for me, found your website on internet. All your video is easy to follow, easy to understand. I thinking about make this recipe for my Mother in law on Mother’s day. She Loves Chocolate a lot. Thank you again. Hope you will have more video recipes in future. Thanks! And good luck with the recipe. Hopefully, your mother-in-law will love it ! 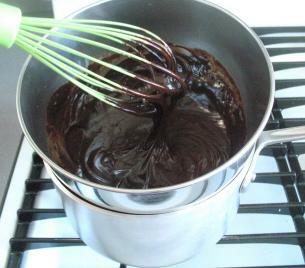 I am sure it is possible to substitute the semi-sweet chocolate and honey with unsweetened chocolate and golden syrup. I am hesitant in giving out substitutions without testing them first. 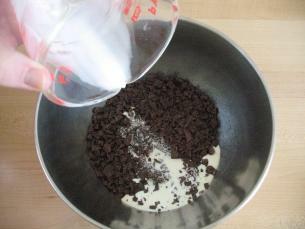 Consequently I think it best to find another recipe that suits your specific ingredients. hi.. i’m only 15 years old and i just wanna ask if it is possible to bake in a microwave oven?